Well after much debate, it's been decided that Poppa, Psycho, and Reese will all be living here with me, however, Reese may have to get neutered or something, he's kinda aggressive and not really as friendly as either Poppa, or Psycho, Keith says that I should call him PReese (the P being silent-so that his name starts with a P too!) But maybe that's just his personality. The cats don't seem to mind them, and they don't seem to really mind the cats either, so after Christmas we're going to build them a bigger C&C cage that they will all have more room in, Casey's swimming pool really just doesn't seem quite big enough for the three of them, but they do love cozy sacks! Question.....how does one go about cutting a pigs nails? Neutering won't change his personality and won't calm him down. They're teenage pigs, this is normal. I don't know if neutering will help anythig or not. If he's not causing injury, I wouldn't worry too much. Like Jennicat said, their age really does have a lot to do with the behavior. As for the nail clipping, I bought some special clippers that are rounded and they work well. Just be sure NOT to clip into the pink area--this will cause pain and bleeding!!! Just clip the tips off. Mine hate to have it done so I have to hold them a while and try to get them nice and calm before attempting!! Oh you ain't kidding!!! I HATE trimming them, but it has to be done!!! LMAO Duly noted! They all have dark nails, so I'd just have to clip the very ends off, they're kinda sharp. I've decided that I'm just going to try an win Reese over with some treats-he just keeps turning his head into a corner, and making a very "keep away" noise at me. But he won't run and hide in their box either, while he won't take treats from my hands, he will eat his apple (olive branch) after I take my hand away. I thought maybe neutering would help him-he really likes to chase Poppa and Psycho around and "ride" their faces. It's kinda disturbing! I have noticed though that they learn quickly though-from their current location they can see the fridge, and anytime you open it-they all assume that you MUST be getting them something from inside of it! Or if they even hear a sound that resembles a sound like the food/treat/salad bag it must be for them. And thanks everyone for telling me that Guinea Pigs "sleep" with their eyes open!!! Freaked me out! And I litterally scared the pee right outta Poppa! I thought he'd died! But I take it as a good sign that he was comfortable enough to "sleep" where I could see him-and not wake up when I touched him!? Later I'm going to take them upstairs to the spare bedroom for their first bout of floor time...I'll have to take some pictures...it should be fun! Nah, pigs are different than rabbits. They won't become less aggressive or easier to introduce if you neuter them -- they just become infertile. Even if he's neutered, he'll hump their faces. Females hump each other and males too. That's just how pigs are. When they hump like that, he's more than likely establishing dominance! He's letting the others know he's "the man"!!! Squeakers did that a LOT to Phineas for a while until Phineas accepted him as alpha male. Now he only does is if Phineas crosses a line so to speak!!! They sound totally normal!! 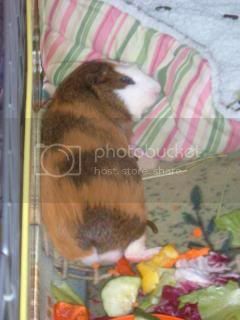 My Phineas fell asleep while I was petting him on my bed once. I petted him, poked him, he didn't move so I started to pick him up--he was sorta limp. I TOTALLY freaked out when he jumped in the middle of me picking him up!!! My avatar is Phineas out cold right in the open with his eyes open!! I thought it was adorable!! Here's a closer pic of it! One of my favs!!! Aww that is the cutest pic ever!!!! I just never knew they slept like that! Poor Poppa, I scared him, and myself half to death. Today I put a Huge Cardboard Tube in their pool/cage area, they played in it, it was too funny! They also really seemed amused that I felt the need to clean out their cage, and root around in the new bedding. Thanks! Mine love when I clean the cage. I try to rearrange a little each time. They popcorn like mad when I put them back in!! I love my pigs so much!! I wanted them for so long, I just can't believe we finally have them--and how much fun they are! !